Neurohumoral stimulation comprising both autonomic-nervous-system dysfunction and activation of hormonal systems including the renin-angiotensin-aldosterone system (RAAS) was found to be associated with Type-2-diabetes (T2D). Therapeutic strategies such as RAAS interference proved to be beneficial in both T2D treatment and prevention. In addition to an activated RAAS, hyperleptinemia in obesity, hyperinsulinemia in conditions of peripheral insulin resistance and overall oxidative stress in T2D represent known activators of the sympathetic component of the autonomic nervous system. Here, we hypothesize that sympathetic activation may cause peripheral insulin resistance defined as partial blocking of insulin effects on glucose uptake. Resulting hyperinsulinemia or hyperglycemia-related oxidative stress may further aggravate sympatho-excitation. This notion leads to a secondary hypothesis: sympathetic activation worsens from obesity towards insulin resistance, and further towards T2D. 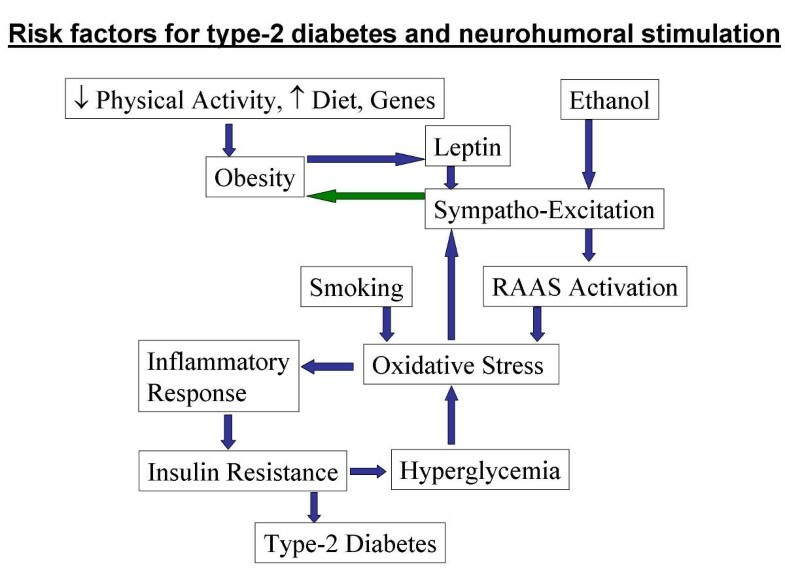 In this review, existing evidence relating to neurohumoral stimulation in T2D and consequences thereof, such as oxidative stress and inflammation, are discussed. The aim of this review is to provide a rationale for therapies, which are able to intercept neuroendocrine pathways in T2D and precursor states such as obesity. Both Type-2-Diabetes (T2D) and Chronic Heart Failure (CHF) may be perceived as consequences of originally diverse pathologies. In the CHF condition, the diagnosis of ischemic or non-ischemic etiology does not imply a different prognosis nor, with exception of antiarrhythmic strategies, treatment modality. Likewise, except for pancreatic-islet-transplant issues, the fundamental and adjunctive therapies for long standing, insulin-dependent T2D are the same, regardless the underlying reasons for T2D. Once advanced stages of T2D have been reached, different etiologies, i.e. genetically or environmentally caused T2D, appear of less importance to disease management and prognosis. Therefore, uniform disease mechanisms pertinent for disease progression in T2D need to be identified. As such a mechanism, neurohumoral stimulation comprising autonomic-nervous-system (ANS) dysfunction, i.e. sympathetic activation and vagal deactivation, as well as activation of hormones such as the renin-angiotensin-aldosterone system (RAAS) may be considered. The concept of neurohumoral stimulation was first applied to CHF, where plasma norepinephrine , atrial natriuretic peptide , B-type natriuretic peptide  and endothelin-1  were found to be correlated with mortality or severity of disease. In T2D neurohumoral stimulation exists as well. There, ANS dysfunction  and the RAAS [6, 7] are critically involved. In addition, neurohumoral stimulation may involve adipose-tissue hormones given that obesity is one risk factor for T2D  as well as gastrointestinal neuropeptidergic inputs . Hormone actions may affect insulin sensitivity, oxidative stress, inflammation and endothelial function (Table 1) as well as the ANS (Table 2). Hormone effects on insulin sensitivity, oxidative stress, inflammation and endothelial function. Consequences of hormone actions on oxidative stress, inflammatory responses, and endothelial-cell dysfunction were summarized from published evidence. Arrows indicate the direction of hormone-mediated changes, question marks indicate unknown effects. Hormone effects on the autonomic nervous system. Sympathetic effects of hormones were derived from published evidence either from direct nerve recordings or power-spectral analysis of heart rate (low-frequency band). Vagal effects of hormones were assumed when heart rate variability was demonstrated to increase or when changes in the high-frequency band of power-spectral analysis of heart rate occurred. Arrows indicate the direction of the hormone-mediated changes, question marks indicate unknown effects. We hypothesize that persistent sympathetic-nervous-system activation actually represents one cause of peripheral insulin resistance (IR) defined as partial blocking of insulin effects on glucose uptake emphasizing oxidative stress and inflammation as possible links between neurohumoral stimulation and IR. First, T2D-relevant hormones and the ANS are reviewed. Second, consequences of neurohumoral stimulation such as oxidative stress and inflammation are highlighted with regard to IR. Beyond the hypoglycemic action, insulin activates the sympathetic nervous system, while withdrawing the vagal component of the ANS [10, 11]. Furthermore, insulin enhances endothelial nitric-oxide synthase (eNOS)  which determines microvascular tone and may neutralize reactive oxygen species (ROS). We hypothesize that ANS dysfunction in terms of sympathetic activation, from whatever source, deteriorates peripheral insulin sensitivity, thus leading to repetitive hyperinsulinemia and hyperglycemia. If this hypothesis holds true, resulting hyperinsulinemia may further activate the sympathetic component of the ANS. Moreover, as hallmarks of type-2 diabetes, continued hyperinsulinemia may lead to pancreatic beta-cell exhaustion , while repetitive hyperglycemia may increase oxidative stress [13, 14]. Obesity is a major risk factor for T2D . Adipokines such as leptin, resistin and adiponectin seem to be involved in IR. As stated in Figure 1, hyperleptinemia occurring in obesity directly activates the sympathetic nervous system [17–19]. Leptin increases oxidative stress , however, it may further attenuate interleukin activation . Both leptin and resistin serum levels have been found to be associated with IR . Conversely, the duodenum-derived ghrelin  and adiponectin [23, 24] were demonstrated to correlate with insulin sensitivity. ANS effects of resistin, adiponectin or of ghrelin are currently unknown. However, on endothelial cells, resistin promotes the release of endothelin-1 , known to be sympatho-excitatory . Besides the possible role of adipokines on the ANS, cellular and subcellular adipocyte signalling issues may yield further insight into the special role of abdominal obesity for T2D . Relationships between known risk factors for T2D, neurohumoral factors and consequences thereof including oxidative stress and inflammatory response leading to peripheral IR and T2D. Blue arrows represent stimulation pathways, green arrow represents inhibition. Catecholamines deteriorate insulin sensitivity as shown by high plasma concentrations of catecholamines in pheochromocytoma patients. There, insulin sensitivity was restored by tumor-removal surgery . On the molecular level β-adrenergic stimulation itself inhibits insulin signaling molecules such as insulin receptor substrates, which have been shown to be essential for insulin action [29–31]. Furthermore, expression of adiponectin is inhibited, whereas IR-inducing IL-6 is stimulated by β-adrenergic activation in fat cells [32, 33]. However, beta-adrenergic receptor blocking drugs have not shown any effect on insulin sensitivity . Both metabolic counteractive effects of beta-adrenergic blockade on pancreas-islet function and possibly still-active sympathetic stimulation via autonomic nerve fibers  may explain the lack of effect of beta-adrenergic blockade on IR. However, third-generation, vasodilating beta-blocking agents may set off possible adverse metabolic effects and confer a benefit for individuals having IR  bearing in mind that actions of epinephrine and norepinephrine include pro-oxidative  and proinflammatory effects [38, 39]. Recent studies demonstrate the beneficial nature of therapeutic angiotensin-2 blockade in T2D using either angiotensin-converting-enzyme (ACE) inhibitors or direct angiotensin-2, subtype-1 receptor (AT1) antagonists [7, 40, 41]. Several mechanisms may account for this. First, angiotensin 2 acts as a sympathetic-nervous-system activator  and as a deactivator of vagal function . Secondly, the activation of the RAAS facilitates the generation of free ROS via a NADPH-oxidase mechanism , leading to oxidative injury  and IR. Furthermore, angiotensin 2 elicits a pro-inflammatory, monocytic response . Conversely, the blockade of the RAAS elicits a reduction of oxidative stress , a decrease of CRP as a marker of inflammation , a restoration of endothelial function , and an increase of adiponectin concentration , indicating an adipocyte-mediated amelioration of insulin sensitivity . Aldosterone may independently contribute to adverse effects, given the observation, that aldosterone release may "escape" an ACE-inhibition or AT1 blockade . Pharmacological or surgical correction of hyperaldosteronism has been shown to improve insulin sensitivity . Moreover, an elevated plasma aldosterone is associated with pro-inflammatory and pro-oxidative effects  and may confer endothelial dysfunction . Indirect evidence suggests aldosterone to be associated with an attenuated vagal  and cardiac sympathetic function . However, especially for aldosterone effects on the sympathetic nervous system, there is no conclusive evidence available, yet. Endothelin-1 is a most potent, mainly endothelially derived vasoconstrictor. Endothelin-1 concentrations were found to be increased in T2D . Endothelin-receptor-A blockade improves endothelial dysfunction in T2D and obesity . Moreover, chronic endothelin-1 application is associated with elevated oxidative stress [59, 60], inflammatory reaction within the arterial wall  and IR . The principle of endothelin-1 blockade may, therefore, have beneficial effects in patients with T2D. Those effects may include an attenuation of prevalent sympatho-excitation as shown in the CHF condition . Paradoxically, ANS dysfunction in terms of an activation of the sympathetic nervous system either increases or blunts insulin sensitivity. On the one hand, sympathetic activation may increase energy expenditure  and mediate lipolysis , thereby possibly reducing overweight as beta adrenergic blockade implies . Thus, sympathetic activation may primarily serve as a compensatory mechanism. On the other hand, too much sympathetic activation may lead to IR: caffeine, eliciting sympathetic activation, has been shown to diminish peripheral-tissue insulin sensitivity . Pheochromocytoma patients clearly have IR due to the high plasma concentrations of norepinephrine , and non-diabetic patients with sympatho-excitation due to spinal-chord injury were shown to have IR . Moreover, heart-rate recovery following exercise-capacity tests as a measure of vagal function and predictor of cardiovascular mortality , correlates with insulin sensitivity . Thus, once sympatho-activation or vagal deactivation is persistent, deleterious consequences such as IR may occur. Therefore, we hypothesize that sympatho-excitation, i.e. persistent sympathetic activation, may cause IR either directly via signalling effects within target cells or, indirectly, via oxidative-stress induced inflammatory responses. The attenuation of sympatho-excitation by centrally acting antiadrenergic drugs such as moxonidin slightly reduced IR  as a further indication of the validity of our hypothesis. Mechanistically, a reduced nitric-oxide (NO) availability may be involved in the evolution of sympatho-excitation given the fact that certain eNOS polymorphisms are concomitant with a higher T2D and IR susceptibility . Besides cardiovascular NO effects, central-nervous system NO may exert sympatho-inhibitory effects [72, 73]. Furthermore, life-style modifications such as exercise may restore ANS function in T2D or in precursor states via restoration of cardiovascular reflexes . External factors, such as ethanol and tobacco consumption may further contribute to oxidative stress [75, 76] or sympathetic-nervous-system activation [77, 78]. The individual players of the overall concept of neurohumoral stimulation must still be characterized. As Figure 1 shows, the known T2D risk factors may ultimately affect the sympathetic nervous system, the RAAS and oxidative-stress milieu, once antioxidant pathways are saturated. Oxidative stress is a candidate mechanism connecting neurohumoral stimulation with IR , involving either an activated, vascular-smooth-muscle NADPH oxidase  or uncoupled nitric-oxide synthase. Those sources of "internal" oxidative-stress may be therapeutic targets. Other sources of internal oxidative stress, such as cytochrome-c leakage of superoxide anion, may be involved in (as well being the reason for) oxidative-stress sequelae such as carbonylation of proteins as seen in T2D . Besides subcellular effects on insulin signalling , oxidative stress may lead to an activation of cytokines [82, 83] as well as to an activation of the sympathetic nervous system , possibly via desensitized afferent fibers of the sympatho-inhibitory baroreflex . Thus, once RAAS-mediated oxidative stress is not compensated, another vicious cycle begins, aggravating IR towards T2D. According to Figure 2, it appears to be important to intervene in the possible vicious cycles involving the activation of the RAAS and the sympathetic nervous system. As both ACE inhibitors and AT1 antagonists interfere with the RAAS, hydroxy-methyl-glutaryl-CoA-reductase inhibitors or statins may have the potential to attenuate sympatho-excitation [73, 86] possibly by preventing NADPH oxidase activation as a source of endogenous oxidative stress [14, 87]. In both type-1 and type-2-diabetes mellitus, the latter drug clearly improved outcomes , however, peroral antioxidants did not . One may argue that oxidative stress associated with T2D, atherosclerosis and hypertension is therapeutically accessible solely by drugs affecting internal sources of oxidative stress such as statins  or AT1 blockade . Besides inflammation, vasodilatory or endothelial dysfunction may be another consequence of enhanced oxidative stress by ROS scavenging endothelial-cell derived nitric oxide . Suggested therapeutic interventions with regard to the framework of T2D risk factors and neurohumoral factors given in Figure 1. Solid lines across empty arrows signify blocked pathways; dotted lines across solid arrows represent attenuated pathways. Inflammatory responses are likely to be due to oxidative-stress mediated alterations of cytokine expression including interleukin-6 . Interleukin-6, in turn, elicits a CRP release from the liver . The principle of ROS-mediated inflammation has been demonstrated using ultraviolet light [92, 93]. Although more research is needed, this suggested relationship may underly the inflammatory responses seen in atherosclerosis, obesity, and T2D. Prevalent inflammation may at least partially explain the occurrence of IR amid neurohumoral stimulation given the known roles of cytokines and of acute-phase reactants in IR [94, 95]. In fact, inflammation has been shown to be one risk factor for T2D . As yet another proposed vicious cycle, repetitive hyperglycemia due to IR may further aggravate the oxidative stress  as well as the cytokine-mediated inflammatory response (Figure 1). The summarized evidence suggests that neuroendocrine mechanisms participate in T2D evolution. Neurohumoral stimulation is likely to be an important cause for the oxidative-stress milieu, the state of inflammation, and insulin resistance. Therefore, we propose the hypothesis that ANS dysfunction, most likely sympathetic-nervous-system activation, represents one cause of IR likely to be mediated by oxidative-stress induced inflammation. For both T2D treatment and prevention, this hypothesis may serve as a rationale for both pharmaceutical and non-pharmaceutical interventions to restore ANS tone and insulin sensitivity. 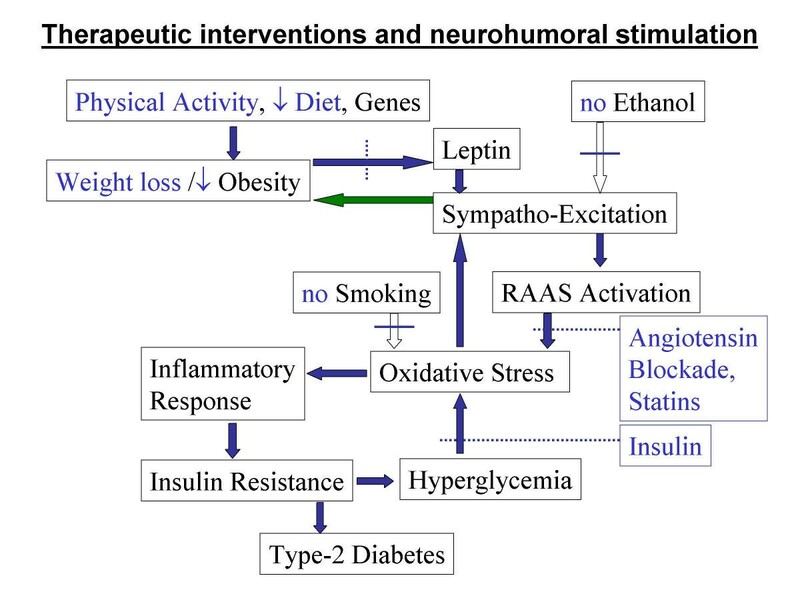 Treatments, that are likely to affect ANS tone and insulin sensitivity may include RAAS interference, statin therapy, endothelin antagonism, or weight-control programs through exercise and/or hypocaloric diet (Figure 2). Because IR is difficult to measure, a practical approach may involve non-diabetic individuals having 'metabolic syndrome' . Metabolic syndrome implies a 24.5-fold elevated risk for incidence of T2D  probably due to an underlying peripheral IR. Disturbed autonomic activity in terms of sympathetic activation and vagal deactivation may be a candidate mechanism for both the conversion processes of obesity to metabolic syndrome and of metabolic syndrome to T2D. Overall, clinical studies in T2D patients as well as in patients at risk for the development of T2D should determine ANS surrogates, such as muscle sympathetic nerve activity or heart rate variability, to further elucidate the role of ANS dysfunction in T2D evolution. The authors wish to thank Dr. M. Mann, University of Nebraska Medical Center, for his comments and help in the editing process. RUP constructed the hypothesis and drafted the manuscript. MF and MB added insight into the sections concerning adipokines and catecholamines. RP participated in finalizing the manuscript. All authors read and approved the manuscript.